The Ionic ® Tote Starter Kit contains 1 quart bottles of Ionic ®Grow, Bloom, & PK Boost along with a product card containing specific nutrient information and usage directions. 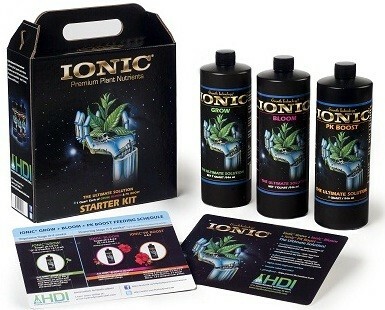 The Ionic Tote Starter Kit contains quart bottles of the Ionic ® single-part plant nutrient line including Grow, Bloom, & PK Boost. Also included is a feed schedule with usage instructions and product descriptions.